This entry was posted on January 30, 2015 by admin. The video below is of Dr. William Courtney, Founder of the Cannabis International Foundation, doing an interview on Huffington Post Live. In it he explains how the western medical mind has a hard time understanding the diverse actions of cannabidiol. He also explains how his youngest patient of 8 months old had a very large, centrally located brain tumor. 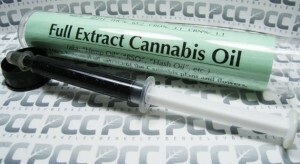 The child was given (by her father) cannabis oil via her pacifier, gradually increasing the dose. Within two months there was a large reduction of the tumor. This is another human case that coincides with the enormous amount of research that proves the efficacy of cannabis with regards to reducing tumors. Right now, the very first human trails using cannabis to treat brain cancer are under way. You can read more about that HERE. I recently received an email of an individual with cancer expressing her frustration about her oncologist refusing to even talk about cannabis treatment for cancer. It’s hard to believe that in the United States there are only two approved treatments for cancer – radiation and chemotherapy. It’s also hard to believe that not all doctors would be aware of the tremendous healing and therapeutic potentials of this plant. Many people with cancer these days are exploring alternative treatments. It’s definitely important to keep up with research and to be aware of what is happening in the world of traditional and alternative medicine. As I mention in all of my cannabis articles (for those who don’t know), cannabinoids refer to any group of related compounds called endocannabinoids and they play an important role in many processes within the human body that help to create a healthy environment. Cannabis has been proven to reduce cancer cells for a long time now, as it has a great impact on the rebuilding of the immune system. This doesn’t include smoking it. Success is usually achieved by creating oil from the plant or eating the plant. If you’d like to start on your own research you can start here. This is some of the information we’ve found but there is a lot more out there, so make sure to do your own research. We’ve already seen a number of success stories with regards to people using cannabis to treat their cancer. In fact, the last article I wrote on this subject was about Mykayla Comstock, the 9 year old girl who used cannabis to cure her cancer. Here are a few studies I found that show cannabis can be effective when it comes to brain cancer, but there is A LOT more research out there, hopefully this gets you started if you are interested.